Maccha 早春の香 (Shinsei Watarai-cha): total cesium 11 Bq/kg. Tea was made [into maccha form] in April. Maccha 早春の香 (Shinsei Watarai-cha): total cesium 66 Bq/kg. Tea was made [into maccha form] in March. Maccha 早春の香 (Shinsei Watarai-cha): total cesium 37 Bq/kg. Tea was made [into maccha form] in April. There is no information when the tea was picked. Shinsei Watarai-cha is an organic tea grown in Watarai-cho in Mie Prefecture. On checking the environmental database by Japan Chemical Analysis Center, I've found that the highest level of radioactive cesium (Cs-137) in green tea in Mie Prefecture was in 1988 at 2.9 becquerels/kg. In the past 10 years, it was either "not detected" or less than 0.1 becquerels/kg. Watarai-cho is located just southwest of Ise City in Mie. Ise City is famous for the Ise Grand Shrine. By the way, Mie Prefecture is accepting the disaster debris from Iwate and Miyagi. The governor of Mie signed the agreements with his counterparts in Iwate and Miyagi, despite oppositions from mayors in Mie, including the mayor of Ise City and the mayor of Watarai-cho. Kontan_Bigcat: 7 to 9 becquerels/kg of cesium was detected last year from tea in Mie. Kouta Kinoshita: it is possible that the number is high relative to the level of contamination in Mie, because the tea was organically grown. The tea that was made into maccha tea was from Aichi Prefecture, east of Mie Prefecture, even though the company who made the maccha tea is a tea grower and blender in Mie Prefecture. 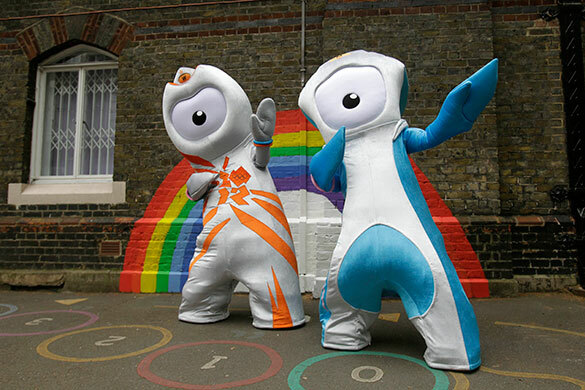 For the past Olympic mascots, The Guardian has some photos here. The number is below the provisional safety limit of 500 becquerels/kg that was in effect till April 1 this year, and would be above the new safety limit of 100 becquerels/kg if the testing method for green tea remained the same. Well it didn't. Starting April 1, 2012, you only test green tea after it's brewed, and test the liquid. If that tests less than 10 becquerels/kg, it is supposed to be "safe" as far as the regulation goes. But Security Tokyo, a private entity that has been conducting the very precise, professional measuring of radioactive materials using the calibrated germanium semiconductor detector, is testing the green tea ("Sayama-cha") made in Tokyo last year the old way - measuring the dry leaves. Sayama-cha made in Tokyo: we're detecting 210 becquerels/kg of radioactive cesium. We are still measuring. The tea was being sold at a supermarket in Tokyo. We haven't tested the tea after it is brewed. Judging from the limited result from Shizuoka Prefecture last year*, the brewed tea may have between 1% to 1.3% of radioactive cesium detected in the dry leaves. In this case, 2 to 3 becquerels/kg, totally "safe". The testing method to be used from this year on would in effect result in relaxing the safety limit for green tea IF the testing method remained the same. Now, green tea with up to 1,000 becquerels/kg of radioactive cesium in dry leaves may "safely" pass the test (brewed tea with 10 becquerels/kg of cesium or less). It seems Shizuoka Prefecture and Saitama Prefecture (main growing region for Sayama-tea) will only announce the results of brewed tea this year. Fukushima Minpo, local Fukushima paper, has a very interesting series on the background of the Fukushima I Nuclear Power Plant accident. Looking back 10, 20 years or more, the paper tries to identify the root cause of the accident on the local level, on the prefectural level, and the national level through the eyes of the local or prefectural government. I haven't read the whole series (9 articles so far) myself, but I want to share the snippets that are still astounding after all that has happened since March 11, 2011, and point to the mentality that may have still existed when the accident happened, which may be uniquely Japanese. Head in the sand? I would like to think of it as "kuroko" in Kabuki. "Kuroko", meaning literally "person in black", comes on the stage dressed in black to help with the changing of costumes for the actors, and operates tools for theatrical effects. He is there for anyone to see, but as an audience you are not supposed to see him even if you do see him. It is an unspoken rule that he doesn't exist, even if he does exist. In July 1989, Takeo Niitsuma, newly appointed as the general manager of the prefecture's life and welfare department, instructed his subordinates to modify the plan for the nuclear emergency preparedness drill scheduled in November. "The drill is meaningless without the participation of people who lives in the area where the nuclear power plant is located. Create the plan that allow the residents to practice evacuation." His department is in charge of disaster preparedness, consumer protection, welfare, and other areas that are familiar to people in the prefecture. As the general manager of the department, Niitsuma wanted the drill that would take the residents into consideration. The staff member in the fire and emergency section that was in charge of the drill conveyed Niitsuma's thinking to the Ministry of International Trade and Industry (today's Ministry of Economy, Trade and Industry) and the Science and Technology Agency (part of today's Ministry of Education and Science). But the word from the national government was totally unexpected. "It's impossible for a nuclear power plant to have an accident. There is no need to have the residents participate in the drill. That would fan unnecessary fears." Isn't that interesting. Dr. Haruki "Detarame" (falsehood) Madarame told then-Prime Minister Naoto Kan on board the helicopter on the way to Fukushima I Nuke Plant on March 12, 2011, "Don't worry. It's impossible for the reactor to blow up. It's structurally impossible." "I want to have the drill that deals with a severe accident." About 10 years ago, a staff member in charge of nuclear emergency preparedness asked the major departments in the prefectural government. But he received an unexpected answer from some departments. "There is no such word [as "severe accident"]." It was when the idea of having a severe accident was not publicly discussed in the nuclear energy administration. The paper is a local paper in Fukushima Prefecture, so there may be a bias toward portraying the prefectural government as having tried hard to persuade the national government to do the right thing. It was unfortunate that officials in the prefectural government were the ones who deleted SPEEDI simulations that came, didn't use simulations that came from the Nuclear and Industrial Safety Agency and from TEPCO. I looked but couldn't find the equivalent Japanese article. Foreigners are buying land in Japan, particularly in Hokkaido. Buyers are from Hong Kong and Singapore, according to a survey done by Yomiuri Shinbun. But the paper notes that there are more deals that remain disguised, as many buyers use Japanese front companies for the transaction to hide their identities. At least 1,100 hectares of mountain forest and other land have been acquired by foreigners, with Hokkaido providing the lion's share, according to a Yomiuri Shimbun survey. A real estate agency in the Kanto region that was involved in the sale of a mountain forest to a foreign customer said: "Even though foreigners don't aim to obtain water resources, their acquisitions could cause consternation. They feel safe if their deals are registered under a Japanese name." "It's necessary to establish an ordinance on land transactions at a local level so that local governments are fully aware of the owners of land and water sources," said Makoto Ebina, a professor at Otaru University of Commerce who participated in a discussion on the ordinance in Hokkaido. "However, as many land transactions are unclear because names are borrowed, it's important to carefully check out each transaction," Ebina said. While checking the Tokyo Metropolitan government website for information on falsified cucumbers at the request from a reader, I found this instead. The Tokyo Metropolitan government has set up a fund to collect donations for the purchase of Senkaku Islands. Nothing better to do for this whacky, jingoistic governor who continues to do absolutely nothing to clean up the contamination in Tokyo. Oh by the way your donation is tax-deductible. The company wants to raise the utility charges by 700 yen (US$8.70) per average household whose utility bill is 6,973 yen per month. If the national government approves, the rate hike will be effective in July. On April 27, TEPCO submitted the Special Business Plan to Minister of Economy, Trade and Industry Yukio Edano including cost-cutting measures, which are prerequisite for the financial support from the national government. TEPCO is requesting the government assistance for the decommissioning and decontamination of Fukushima I Nuclear Power Plant. The company has determined that it would be difficult to bear the additional cost of several trillion yen on its own. The plan includes the rate hike for the utility charges for households starting July, by "slightly over 10%". If the government approves it, the monthly utility charges for the average household (6973 yen for the month of June) will rise by 700 yen. After the rate hike in July, the government will inject capital using public money, effectively nationalizing the company. The government currently plans to support TEPCO on disaster compensation payments with 2.5462 trillion yen [US$31.6 billion], but the decommissioning of the reactors is not part of the support and has to be borne by TEPCO. The additional burden of several trillion yen [for decommissioning and decontamination] on TEPCO might render the company insolvent. So the work that still continues at Fukushima I Nuclear Power Plant is not supported by the national government, and the TEPCO household customers in Kanto region will have to pick up the tab so that TEPCO can continue the work. Something's not right. But then, the national government is broke to the tune of the debt to GDP ratio of 240% (the US just passed 100% mark at the end of March by the way), and any money coming out of the government will be taken from the taxpayers anyway, whether it's for disaster compensation or decommissioning. So much for clean and cheap energy that was nuclear. And US$31.6 billion worth of money from the government for disaster compensation? Peanuts. The US Treasury Department raises that kind of amount in one single treasury auction. It was discovered by the information from a citizen. Any penalty? Nah. The Tokyo Metropolitan government told the wholesaler to try their best not to do that again. It was revealed that a intermediate wholesaler of vegetables [who buys from a wholesaler and sells to a retailer] in Adachi-ku in Tokyo had sold cucumbers made in Fukushima Prefecture by putting "Made in Yamagata" stickers. In September last year, intermediate wholesaler of vegetables "Daikane Bunki" in Adachi-ku, Tokyo sold 358 boxes of cucumbers made in Fukushima to retailers to be sold to the consumers. The company, when they packaged the cucumbers in small bags, put the "made in Yamagata" and "made in Iwate" stickers. The Tokyo metropolitan government investigated on the tip from a citizen. Daikane Bunki says, "We couldn't secure enough cucumbers from Yamagata and Iwate". So they packaged the cucumbers from Fukushima that they had in the inventory, and sold them. The Tokyo metropolitan government instructed the company that it should try not to do that again. The wholesaler Daikane Bunki either took down their website or the site is inundated by irate consumers. Either way, it seems to have been removed. Then again, the monitoring was a sample testing, picking one plot of farmland per village/town/city and pick one vegetable, washing it carefully and measuring it. Then the whole village/town/city was declared "safe", and the shipment of the vegetable was freely allowed when the vegetable tested below the provisional safety limits of 2,000 becquerels/kg of iodine-131, and 500 becquerels/kg of radioactive cesium. In retrospect, it shouldn't have engendered much confidence among the consumers, but it did; back then not many consumers were aware of the sample testing method. I remember reading a tweet by a Fukushima farmer very early on in the crisis (in early April, maybe), warning against this testing method, saying 99.9% of the vegetables or fruits from Fukushima were not tested. I remember retweeting his tweet, but that fell on deaf years back then. There are still people out there in the positions of power and authority - politicians of major cities (like the mayor of Yokohama who kept feeding her city's school children with cesium beef), or a kindergarten principal (who ended up feeding her kindergarteners with mushrooms loaded with radioactive cesium recently) - who continue to believe "What's being sold in the market is safe". NHK News: "30 People Died of Acute Radiation Sickness in Chernobyl Accident"
That's the only deaths that NHK mentions in the news on April 26, 2012, on the 26th anniversary of the Chernobyl Nuclear Plant accident. At Chernobyl Nuclear Power Plant, an explosion happened in the reactor during the test run on April 26, 1986, dispersing a large amount of radioactive materials. 130,000 residents inside the 30 kilometer radius from the plant evacuated. In this accident, about 30 people including the plant workers and firefighters died of acute radiation sickness. In the Ukraine, Belarus and Russia, there are big problems even today of dealing with the environmental effect and the damage to the health of the residents due to the dispersion of large amount of radioactive materials. Skip to the 2:40 mark. You get to see the scene around the Reactor 4 building briefly, then inside the building and the top floor where the Spent Fuel Pool is. The video was taken on April 24, 2012 when the vice minister of the cabinet office visited the plant. I posted the photo of a peach juice can from JA Date City in Fukushima the other day. The juice had 34 becquerels/kg of radioactive cesium. Here's the photo of kindergarten children in the same Date City cleaning the mailbox in appreciation for the hard work by mailmen every day. This particular district of Date City, Ryozen-machi, is 50 kilometers from Fukushima I Nuclear Power Plant. The district is dotted with known "hot spots" with elevated radiation. Many locations measured by the city exceeded 1 microsievert/hour at 1 meter off the ground, some exceeding 3 microsieverts/hour (parks) last year. Even at the end of March this year, the highest is 1.28 microsievert/hour in a park at 1 meter off the ground. That didn't stop this particular kindergarten from going through with the routine of thanking the mailmen. I wonder if they did it last year also. Kindergarteners clean mailboxes to show appreciation, as activity for "Memorial Day for Postal Services"
For the "Memorial Day for Postal Services" on April 20, kindergarteners from Shin-ai Kindergarten in Ryozan-machi in Date City cleaned the mailboxes at Kakeda Post Office and Ryozen General Branch Office. 8 kindergarteners visited Kakeda Post Office and handed the letter of appreciation to the manager of the post office that said "Thank you for delivering mail every day". The children polished the mailbox with the cleaning cloth, and decorated the mailbox. After the cleaning, they were given presents by Manager Takagi at the postal office. While the Russian News (RIA Novosti) emphasized the "revitalization" plan for the areas around the Chernobyl Nuclear Power Plant, the Japanese media decided to focus on the other half of the same story: That half of the areas around Chernobyl will be abandoned forever. The media and the Japanese viewers are thinking about the areas around Fukushima I Nuke Plant, of course. Even the national government is starting to doubt the efficacy of "decontamination" in the immediate neighborhood of the plant, even though they have promised the residents that the government will do the decontamination so that they can return someday. Areas around Chernobyl will be "off limits forever"
Part of the areas contaminated by the Chernobyl nuclear accident will be off limits forever. Deputy head of the contaminated area management agency [I have no idea what the official name is] said, "The current no-entry zone is 2,000 square kilometers, but about half (1,000 square kilometers) will be off limits forever." The government agency in charge of managing the areas in the Ukrane that have been contaminated by the Chernobyl accident declared on April 24 that the half of the no-entry zone will remain no-entry zone forever. The area is big, about 1.6 times the size of the Tokyo's 23 Special Wards. It will be 26 years on April 26 since the accident. 2 Videos: "Chernobyl 25 Years Later" and "Fukushima One Year Later"
Several readers linked the Youtube video titled "Chernobyl 4 ever" by Belgian director Alain de Halleux, depicting the Chernobyl accident after 25 years. So I thought I would show the video here. I didn't know that they have nuclear fuel to deal with that was used in the other three reactors at Chernobyl until 2000. "History will repeat itself." Well it did. If that's the case, why should anyone bother to do anything with the Chernobyl site, not to mention Fukushima? The Reactor 4 SFP contains 204 new fuel assemblies and 1331 spent fuel assemblies. The reporter signs off as "Kyodo News", but reading the postscript part of the article it is clear that this is the original Fukushima Minpo article. It was probably fed to Kyodo News, as Fukushima Minpo is a member of Kyodo News. The series title in the upper right corner: "New Happiness in Japan - Measure"
The article title in the middle: "Think what "food safety" means"
The subtitle of the article: "Cesium beef offered at an event"
From this information, if you conjure up the image of the gist of the article as "OK, the happiness in Japan in post-Fukushima is to gladly eat beef known to contain radioactive cesium to help producers as long as it is measured and disclosed properly, and that's food safety", I'll give you an A. It was quiet in the office district on Sunday. It was March 11 afternoon, one year anniversary of the disaster. Couples with children, middle-aged men in jeans were entering a 12-story public building off the busy streets in Shinjuku, Tokyo. On the tables in the kitchen that is used for cooking classes were the plates with hamburgers just cooked. Mitsuhiro Anada (age 40) told the people in the kitchen, "These contain 6 becquerels/kg [of radioactive cesium]. Please let me know if you don't want to eat them. We have also prepared cesium-free ones." About 30 people then sat at the table and started to eat. Mr. Anada is the head of "Mo-ton Family", a meat processing company located in the northern Iwate. The event, "Let's eat cesium beef" came about after calling the customers who buy ham, hamburger meat and sausages from his company by mail order. The main dishes are the hamburgers and beef stew made from the beef that had been detected with radioactive cesium. Both dishes tested far below the provisional safety limit (500 becquerels/kg [it was still the provisional safety limit in March this year]). "I wanted the consumers to think about what "food safety" means, by showing the number [of radioactive cesium measurement] and having them eat [the meat]", said Anada when asked why he held this event. Mr. Anada and his wife have run the company. They have avoided the beef from cattle fed with imported feed, and insisted on Iwate beef from free-grazing cattle. "Free-grazing cattle are safer, and the meat has richer taste." He made ham, and hamburgers without using chemical additives. But he received a call late September last year from a cattle farmer that he had dealings with. "Radioactive cesium has been detected from the beef. It's below the provisional safety limit, but what do you want to do?" In Iwate Prefecture, the shipment of beef was halted throughout the prefecture after radioactive cesium exceeding the provisional safety limit was found in the beef produced in the prefecture. After the shipment was resumed, the prefectural government started to conduct more thorough testing on shipment. Levels of cesium were non detectable in most beef, but the beef that Anada was planning to buy was found with cesium. Maybe it was the grass in the mountains that they ate. Sure enough, the grass was found with radioactive cesium. "My insistence on natural beef turned against me", said Anada. If he doesn't buy, this beef would be sold at a huge discount, distressing the cattle farmer with whom he had a long-standing relationship. Starting September, he bought the beef from three cows at a regular price. He sent the samples of the meat to a testing laboratory. The result was 10 to 60 becquerels/kg of radioactive cesium. "I wonder if my customers still buy." The freezer in Anada's factory was filled with boxes containing this beef. Thus ends the first installment of the series "New Happiness in Japan". It is hard not to guess what the next installments will be like. They will probably describe Anada's difficult decision to hold the event to educate the consumers, and grateful consumers who brought their own children to the event to learn what it means to be "safe" in the post-Fukushima Japan. And they lived happy ever after, the producer and the consumer, radioactive cesium or not. Many Japanese people in Japan are shaking their heads in disbelief on learning about this event. They don't understand Mr. Anada, and they don't understand parents bringing their children to knowingly feed their children with cesium beef. As I suspected above, the event was probably not free. The participants were probably charged 2,000 yen (US$25, 19 euro), if the Shinjuku event above was like the similar event in Iwate Prefecture. Resist the globalism that severs the local community! As the mayor of Tsuruga City was strongly promoting nuclear power generation in the county in China that has a nuclear power plant with 6 operating reactors and 4 under construction, the Nuclear and Industrial Safety Agency warned the operator of Tsuruga Nuclear Power Plant that Reactor 2 of the plant may be sitting on an active fault. Even in Japan, the national guideline is not expecting a reactor to be built on top of an active fault. Reactor 2 of Tsuruga Nuclear Power Plant is a pressurized water reactor made by Mitsubishi Heavy Industries. Reactor 1 is a light water reactor by GE. Tsuruga's Reactor 2 was considered to be one of the better made PWRs in Japan. Both reactors have been shut down for regular maintenance. Construction of Reactor 2 started in 1982, and the reactor started operation in 1987. Two more reactors are being built at Tsuruga Nuke Plant. The reactors will be Advanced Pressurized Water Reactors (APWR) by Mitsubishi Heavy Industries. If they proceed with the construction, that is. An expert has pointed out the possibility that cracks that run under Tsuruga Nuclear Power Plant in Fukui Prefecture are active faults. The Japan Atomic Power Company (JAPC) is going to do the survey again and come up with the plan. 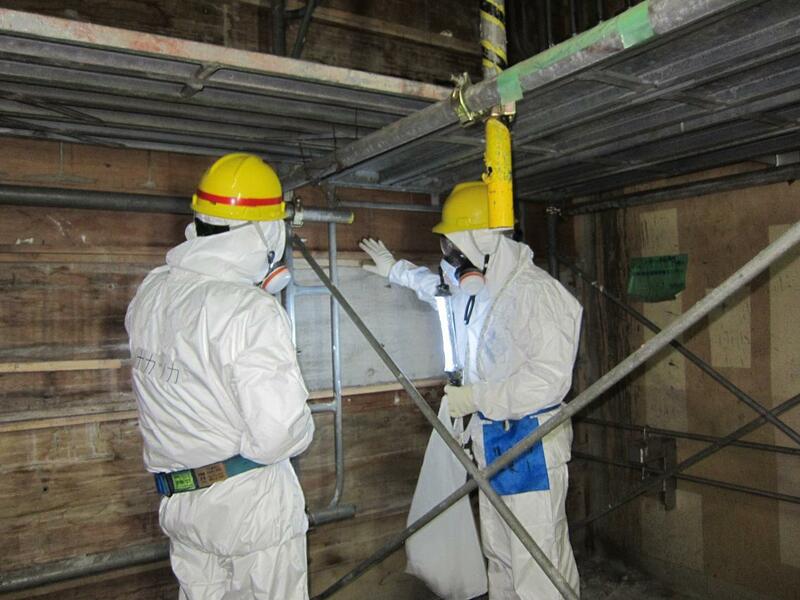 On April 24, an expert in active faults and officials from the Nuclear and Industrial Safety Agency (NISA) studied the area where the strata are exposed at JAPC's Tsuruga Nuclear Power Plant in Tsuruga City in Fukui Prefecture. They particularly looked at the crack called "fracture zone". As the result, the expert pointed out that the crack that runs underground at about 150 meters west of Reactor 2 "may be an active fault, and it may move together with the active fault called Urazoko Fault that runs through the compound, making the shaking from an earthquake bigger than anticipated". There is another crack that runs right beneath Reactor 2. It needs to be studied to determine if it is also an active fault. NISA has instructed JAPC to do the survey again. The guideline for seismic design by the national government does not expect having an important facility of a nuclear power plant right above an active fault. If the crack beneath Reactor 2 turns out to be an active fault, there is a possibility that JAPC cannot restart the reactor. JAPC will report to NISA shortly with the plan for the survey, and will study the strata to decide what to do. JAPC says, "The result of the survey may affect various issues such as expected maximum earthquake and seismic stability of the plant. We would like to proceed very cautiously." Sankei Shinbun never liked Naoto Kan. For that matter, none of the Japanese mainstream media outlets liked him. While he was in charge of the Fukushima I Nuclear Power Plant accident as the prime minister of Japan, they were highly critical of his handling of the accident. That seems to have stopped after Noda was elected as the party leader and prime minister; they hardly snickered at Noda's declaration of "cold shutdown state". Sankei still goes after him with this article on April 24, 2012, albeit obliquely. The article is about the Nuclear and Industrial Safety Agency which is supposed to be abolished and replaced by the new agency under the Ministry of the Environment (Goshi Hosono's influence-peddling outfit), and what a disgrace it was that the agency regulating the nuclear industry had failed so miserably in the first days of the accident. The Nuclear and Industrial Safety Agency has the code of conduct that everyone should adhere to. The first is "Strong sense of duty: carry out tasks with the safety of the citizens first; act aggressively to secure safety in an emergency". The other three are: "Scientific and rational decision-making", "Transparency in carrying out tasks", "Neutrality and fairness". However, these noble ideals codified when the agency was created 11 years ago hadn't become part of the agency. March 12, 2011, when Reactor 1 had a hydrogen explosion. The atmosphere was unusually tense at the Prime Minister's Official Residence where the nuclear disaster response headquarters was set up. The ministers and bureaucrats were scurrying to piece together the fragmented information. But there was one person missing from the scene. Nobuaki Terasawa (age 59), Director General of the NISA was missing. He was the head of the organization that regulates the nuclear industry, and he was also the head of the secretariat of the nuclear disaster response headquarters. He had left the Prime Minister's Official Residence at 7PM on the previous day on March 11, 2011, after the first meeting of the nuclear disaster response headquarters, and had returned to the NISA. "Because I am not the technical person [don't have a technical degree], I decided it was better to have someone there who understood [the nuclear technology] better, rather than me staying there." Terasaka tried to explain in the February 15 hearing of the investigation committee of the Fukushima accident set up by the Diet. Professor Shuya Nomura (age 50) of Chuo University Law School was left speechless. "So the head of the regulating agency was someone who didn't know much about nuclear technology." After he returned to the NISA, Terasawa called the PM's Official Residence "a few times" (according to Terasawa). He was supposed to be the right-hand man for the prime minister as the head of the regulating agency and be in charge of responding to the accident. It didn't work that way at all. It was not Terasawa alone who "fled in the face of the enemy". The Nuclear Safety Inspector and other NISA officials who worked at Fukushima I Nuclear Power Plant did the same. At the time of the accident, there were 8 NISA officials including Nuclear Safety Inspector. In normal times, they would make a tour of inspection on the plant. In an emergency, they were to inspect the scene of the accident and provide information to the NISA. As the situation deteriorated after Reactor 3 had a hydrogen explosion and the vent couldn't be carried out at Reactor 2 to release the radioactive steam from inside the reactor, they withdrew from the plant on their own decision by 5PM on March 14, 2011, 3 days after the start of the accident. So the national government lost the channel through which to obtain information at the scene of the accident, and now had to rely on TEPCO for information. Around the same time the Nuclear Safety Inspectors and others left the plant, TEPCO was said to be asking the government for "complete withdrawal" from the plant. Then-Prime Minister Naoto Kan (age 65) made his way to the TEPCO headquarters in the early morning of March 15, and refused TEPCO's said request to withdraw. But at that time, the government side had already withdrawn from the scene of the accident. I have no problem with having the NISA's head without a technical or science degree. What you would need in the situation like this is not the technical or scientific knowledge but common sense, leadership, good grasp of overall picture, and will and authority to commandeer people who do know technical details. Instead, he simply went home because he didn't have a technical degree. With that kind of director general, it's not surprising at all that the NISA people at the plant withdrew on their own. I wonder if Kan had known about it when he went to TEPCO. Probably not. The NISA head would probably not have told the prime minister, because he probably didn't know about it himself. Belarus may build a second nuclear plant in the country in addition to one already planned for the western Grodno Region, President Alexander Lukashenko said on Tuesday. “If we have your cooperation, support and suitable conditions, we are ready to build a second nuclear power station in Belarus,” the president told International Atomic Energy Agency (IAEA) head Yukiya Amano who is on a visit to Minsk. The $9-billion plant will be built by Russia’s Atomstroyexport company, a subsidiary of state nuclear energy corporation Rosatom. The plant will consist of two reactors with a capacity of 1,200 MW each and will boost the entire Belarusian energy system's capacity to 8,000 MW. The power station’s first unit is due to be ready in 2017 and the second in 2018. Belarus began preparing to build a nuclear plant back in the 1980s, but the project was shelved following the 1986 Chernobyl nuclear disaster in neighboring Ukraine. Belarusian opposition and environmental activists have raised concerns over the project, which were further fuelled by the March 2011 accident at Japan’s Fukushima nuclear power station. Lithuania has demanded the plant be moved away from its border. Russia says it employs advanced technology to ensure accident-free operations at all the power stations it builds. Well, it is not really the technology per se, no matter how advanced, which is the issue here. It is how the plant is managed and operated and the kind of political and social environment that it exists. Abysmal failures on all of them in Japan. How will it be different in Belarus? Maybe it was like selling nuclear power to the Japanese after Hiroshima and Nagasaki, and immediately after the Bikini Atoll (Dai-Go Fukuryu-Maru) - since Japan suffered atomic atrocities, only Japan could use the atomic energy for peaceful purposes. April 25, 2012 at 5:22AM Japan Standard Time. Depth 60 kilometers. USGS says M.5.4. Seismic intensity scale 4 in Chiba (max is 7). 34 becquerels/kg of radioactive cesium found from a can of peach juice from last year's crop that was on sale recently. Not to worry, it is under the new and stricter safety standard of 100 becquerels/kg set by the national government of Japan, so much safer than the international standard, says the Minister of Agriculture. The map was apparently made by Hitachi GE Nuclear Energy. The map is in the report by the Working Council for "Mid-and-long-Term Roadmap towards the Decommissioning of Fukushima Daiichi Nuclear Power Units 1-4". The Council met for the 5th time on April 23, apparently. Hitachi is a member of the Council. 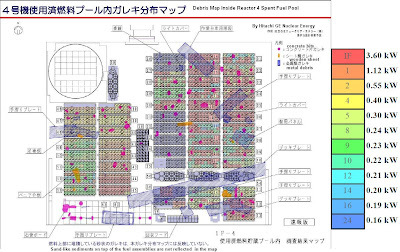 The report is available only in Japanese, and I don't think the detailed debris map (below) was disclosed in the regular press conference (there is no mention of it in the "Handout for the Press" section of their website, either in English or in Japanese. No such map exists in the report for the Reactor 3 SFP, as their survey of the pool the other day was only preliminary, they said. Ukraine's Prime Minister Azarov wants to bring back residents to "abandoned homes, cities and residential areas" in "the contaminated territories adjacent to the crippled Chernobyl nuclear power plant". Well at least he waited for 26 years, unlike the Japanese national government. Ukraine is currently working on an expanded governmental program aimed at sprucing up the contaminated territories adjacent to the crippled Chernobyl nuclear power plant, Prime Minister Mykola Azarov said on Monday. According to experts, the radiation level in Chernobyl’s exclusion zone has significantly decreased in recent years, Azarov said, adding that outside the exclusion zone there are no inhabited areas in Kiev Region with elevated radiation levels. “There are good reasons to revitalize, ‘give a second breath’ to these abandoned homes, cities and residential areas. These are additional work places and additional revenue for our budget,” Azarov said. In late March, Ukraine’s President Viktor Yanukovych said the country would begin the construction of a new sarcophagus at the Chernobyl nuclear plant on April 26, the 26th anniversary of the nuclear disaster. The Chernobyl sarcophagus will cost 935 million euro ($1.2 billion) to build. Most of the money was raised through a donation drive among the world’s governments held last year, with Ukraine only contributing 6 percent of the total. Construction of the confinement chamber, a metal facility 105 meters tall and 260 meters long that will cover the reactor, is to be finished by 2015, Ukrainian officials said earlier. The destroyed reactor was covered by a concrete confinement chamber months after the disaster in 1986 but the facility has since decayed and now threatens to leak radiation. That's according to the Ministry of Economy, Trade and Industry (METI), which continues to be in charge of regulating the nuclear industry because the new and (supposedly) improved Nuclear Regulatory Agency under the Ministry of the Environment is still nowhere to be seen or heard (and likely not to be seen or heard for a very long time, as things are going at this time). Looking at the radiation map that the Ministry published on April 23, 2012, part of Namie-machi, Iitate-mura, Okuma-machi, and Futaba-machi will continue to be more than 20 millisieverts per year external radiation. They are basically the same areas that are in red in the map as of March 2012 (100 millisieverts per year and higher). Also note that the air radiation levels in most of Date City and Fukushima City will still be more than 1 millisievert per year 20 years from now. In the information blackout (natural and intentional) right after the March 11, 2011 earthquake/tsunami/nuclear accident, people inside the 3 kilometer radius from the plant, then 5, 10, 20 kilometer radius, fled in the direction of the red area in the map along Route 114 to Namie-machi. Some then took Route 399 to Iitate-mura　and then to Date City, others through Kawamata-machi on their way to Fukushima City. As the mayor of Namie-machi said in the investigation committee set up by the Diet, people were irradiated unnecessarily because the government didn't say a thing about radiation (other than of course, "no immediate effect on health"). Namie-Machi Resident's Suicide Considered as Protest Against #Fukushima Nuke Plant/Accident By Town's Residents, According to Asahi's "Trap of Prometheus"
Since Asahi has moved the worthy series to the paid subscribers-only section and has been aggressively going after any blog sites that dare re-post the installments of the series, all I can do is to do the meta-analysis - referring to the post of someone who has read the article and commented on it. Here's one from a non-fiction writer Ryuichi Akiba, commenting on the April 23 installment of "Trap of Prometheus". The headline of this particular installment, according to Akiba, is "Everything was completely robbed". The title of this morning (April 23)'s "Trap of Prometheus" series by Asahi Shinbun is "Everything was completely robbed". The article begins with this passage: "In Namie-machi in Fukushima Prefecture, there is another person who committed suicide after the nuclear accident, in addition to Hideyuki Matsumoto. He was from Akougi District. Last November, he returned home from the temporary shelter, and stabbed his stomach to death with a kitchen knife. He was 58 years old. There was no suicide note." So that makes the two who committed suicide from this district. According to Mayor Baba, the radiation level of the district is "estimated to be 200 millisieverts per year". The nuclear plant killed people, and killed their living space. Now, what could we do to to keep alive the memory of the man who committed "seppuku"? I believe it is to quit nuclear power generation right away. If there was no nuclear plant in Fukushima, he didn't need to commit suicide. The suicide of the man described in Asahi's "Trap of Prometheus" installment is describing is this one. What's not reported in the original news of the suicide back in December last year is the reaction of the town's residents, that they consider his death as "seppuku", as protest against the nuclear plant and the accident. The first reported suicide that was clearly the result of the nuclear accident was not even in the high-radiation areas in Fukushima. It was a cabbage farmer in Sukagawa City in Fukushima Prefecture, on March 24, 2011 (one day after the government issued a restriction on consumption of vegetables from Fukushima). In June there was a report of the suicide of a dairy farmer in Soma City, outside the evacuation zones, after he had to give up on dairy farming because of the nuclear accident. For many people including nuclear scientists and engineers, there has been no death because of the Fukushima nuke accident unless one dies of an acute radiation sickness. To them, death by suicide doesn't count. The former "hedge fund hotel" Netflix (NFLX) is taking a dive after reporting the 1st quarter earnings. It is down 14% right now, after hours, going from $101 in the regular session to $87. The recent low was in low 60s in November and December last year. The current "hedge fund hotel" Apple (AAPL) will report its earnings tomorrow after hours. The mayor of Tsuruga City in Fukui Prefecture went to China to exchange ideas with his pro-nuke Chinese counterpart in Haiyan County in Chekiang (or Zhejiang) Province in China. Tsuruga is home to the fast breeder Monju, and Tsuruga Nuclear Power Plant, the 2nd oldest nuclear power plant in Japan. Haiyan County's nuclear power plant, Qinshan Nuclear Power Plant, puts Fukushima I Nuke Plant (for that matter, any of the nuclear reactors anywhere) to shame with 6 operational reactors, 4 under construction, and 1 planned, albeit the size of the reactors are not large. Kazuharu Kawase, Mayor of Tsuruga CIty in Fukui Prefecture, met with the local officials in Haiyan County in Chekiang Province in China on April 23. The county has a nuclear power plant. They all agreed that nuclear power plants should be promoted to revitalize the local economy, while learning the lessons from the Fukushima I Nuclear Power Plant accident. Mayor Kawase pointed out that the anti-nuclear faction has become quite active in Japan, and the atmosphere is such that cool-headed discussion may not be possible. He emphasized his stance as pro-nuclear by saying "We have to take into consideration the low energy self-sufficiency in Japan", and "Nuclear power plants create jobs and revitalize the local economy". The major then proposed an agreement with Haiyan County to jointly develop human resources in the nuclear power sector. Lessons learned by the mayors in Fukushima where Fukushima I Nuclear Power Plant is located (Futaba, Okuma) are clearly not learned by the mayor of Tsuruga, that the once-in-10-million-years accident did happen and wiped out their "jobs and local economy" completely. I guess the Tsuruga mayor is counting on the normal distribution, that a "5-sigma" event won't happen in his lifetime. It looks like the government's PR effort to show that the Reactor 4 spent fuel pool and the top floors of the Reactor 4 building are not toppling over. Vice Minister Ikko Nakatsuka is a DPF politician elected from Kanagawa Prefecture. He is also the Vice Minister of the Reconstruction Agency. The worker who still tweets occasionally from Fukushima I Nuke Plant is saying they are removing the columns on the top operation floor of Reactor 4. The World Economic Forum warned Monday that if Japan turns away from nuclear power rapidly, the country would put its energy security at risk, calling instead for efforts to strengthen the safety of its nuclear power plants over the long term. In a report, the organization known for its annual gathering of political and business leaders in the Swiss resort of Davos called for transparency in relevant information by ensuring the independence of nuclear regulators in Japan, while advocating the need for greater involvement by the International Atomic Energy Agency. The forum noted that the disaster at Tokyo Electric Power Co.'s Fukushima Daiichi nuclear power plant triggered by the March 2011 earthquake and tsunami has heightened public concern over the safety of nuclear power and led the public and policymakers to question the country's energy policy. Full article for subscribers only at Kyodo News. Robert Alvarez: "The Fukushima Nuclear Disaster Is Far From Over"
This was not lost on Senator Ron Wyden (D-OR), who after visiting the site on April 6, wrote to Japan's U.S. ambassador, Ichiro Fujusaki, that "loss of containment in any of these pools... could result an even larger release of radiation than the nuclear accident." Spent nuclear fuel is extraordinarily radioactive and must be handled with great care. In a matter of seconds, an unprotected person one foot away from a single freshly removed spent fuel assembly would receive a lethal dose of radiation within seconds. As one of the most dangerous materials on the planet, spent reactor fuel requires permanent geological isolation to protect humans for thousands of years. It's been 26 years, since the Chernobyl reactor exploded and caught fire releasing enormous amounts of radioactive debris -- seriously contaminating areas over a thousand miles away. Chernobyl revealed the folly of not having an extra barrier of thick concrete and steel surrounding the reactor core that is required for modern plants, in the U.S., Japan and elsewhere. The Fukushima Dai-Ichi accident revealed the folly of operating several nuclear power plants in a high consequence earthquake zone while storing huge amounts of highly radioactive spent fuel in vulnerable pools, high above the ground. What both accidents have in common is widespread environmental contamination from cesium-137. With a half-life of 30, years, Cs-137 gives off penetrating radiation, as it decays and can remain dangerous for hundreds of years. Once in the environment, it mimics potassium as it accumulates in the food chain. When it enters the human body, about 75 percent lodges in muscle tissue, with, perhaps, the most important muscle being the heart. Last week, Tokyo Electric Power Company (TEPCO) revealed plans to remove 2,274 spent fuel assemblies from the damaged reactors that will probably take at least a decade to accomplish. The first priority will be removal of the contents in Pool No. 4. This pool is structurally damaged and contains about 10 times more cesium-137 than released at Chernobyl. Removal of SNF from the No. 4 reactor is optimistically expected to begin at the end of 2013. 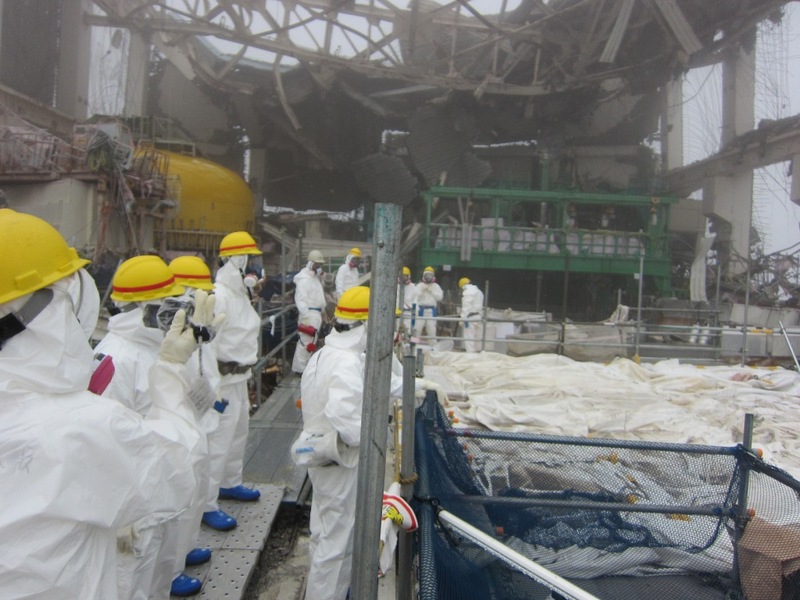 A significant amount of construction to remove debris and reinforce the structurally-damaged reactor buildings, especially the fuel- handling areas, will be required. Also, it is not safe to keep 1,882 spent fuel assemblies containing ~57 million curies of long-lived radioactivity, including nearly 15 times more cs-137 than released at Chernobyl in the elevated pools at reactors 5, 6, and 7, which did not experience meltdowns and explosions. The main reason why there is so much spent fuel at the Da-Ichi site is that the plan to send it off for nuclear recycling has collapsed. It was supposed to go to the incomplete Rokkasho reprocessing plant, just south of the Fukushima nuclear site, where plutonium would be extracted as a fuel for "fast" reactors. This scheme is based on long discredited assumptions that world uranium supplies would be rapidly exhausted and that a new generation of "fast" reactors, which held the promise of making more fuel than they use, would be needed. Over the past 20 years the Rokkasho's costs have tripled along with 18 major delays. World uranium supplies are far from depleted. Moreover, in November of last year, Japan's "fast" reactor project at Monju was cancelled for cost and safety reasons -- dealing a major blow to this whole scheme. The stark reality, if TEPCO's plan is realized, is that nearly all of the spent fuel at the Da-Ichi containing some of the largest concentrations of radioactivity on the planet will remain indefinitely in vulnerable pools. TEPCO wants to store the spent fuel from the damaged reactors in the common pool, and only to resort to dry, cask storage when the common pool's capacity is exceeded. At this time, the common pool is at 80 percent storage capacity and will require removal of SNF to make room. TEPCO's plan is to minimize dry cask storage as much as possible and to rely indefinitely on vulnerable pool storage. Sen. Wyden finds that that TEPCO's plan for remediation carries extraordinary and continuing risk and sensibly recommends that retrieval of spent fuel in existing on-site spent fuel pools to safer storage... in dry casks should be a priority. 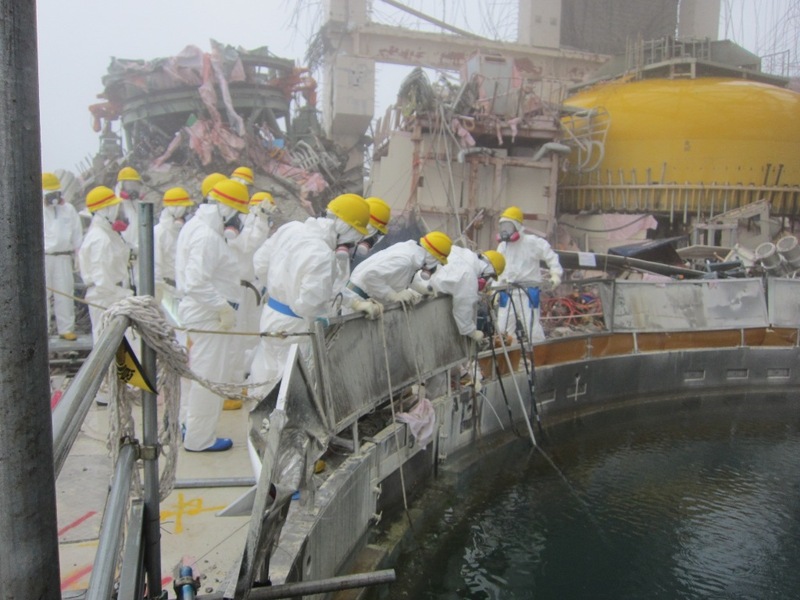 Despite the enormous destruction from the earthquake and tsunami, little attention was paid to the fact that the nine dry spent fuel casks at the Fukushima Da-Ichi site were unscathed. This is an important lesson we cannot afford to ignore. There is no Reactor 7 at Fukushima I Nuclear Power Plant. Reactors 7 and 8 were planned, but the plan was scrapped after the March 11, 2011 disaster. Construction was to start in April 2012. Rokkasho Reprocessing Plant is located at about 280 miles north of Fukushima I Nuke Plant. 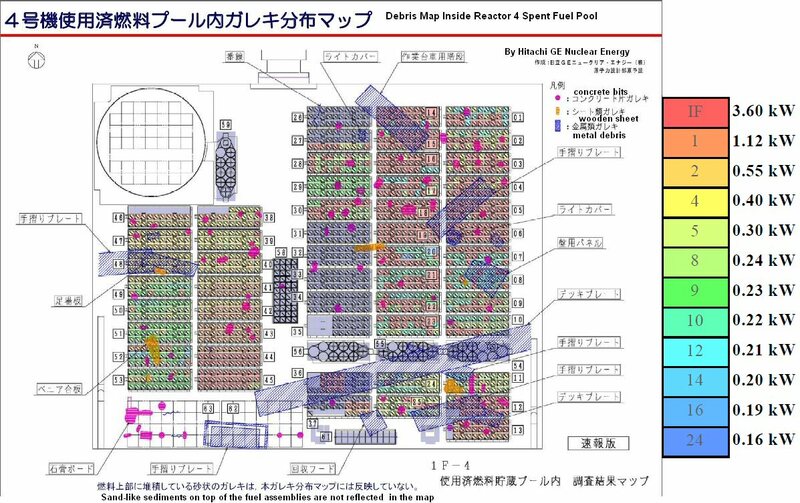 TEPCO does have plans for dry casks, but they are to be used to remove spent fuel assemblies from the common spent fuel pool to make room for the fuel assemblies to be removed from the spent fuel pools in Reactors 1 through 4. I have no idea what I am seeing here. It is supposed to be mostly the image of inside the shield plug on the Containment Vessel of Reactor 3, which TEPCO finally admitted it had been open. The camera is sometimes upside down or sideways, but we cannot complain much to the camera crew (TEPCO employees) who received 8 millisievert radiation for their 4-minute work. Radiation looks to be much higher inside the shield plug. Last November, a Packbot was sent to wipe off the guide rails for the shield plug. The robot was finding the radiation levels to be extremely high along the rails, with the highest at 1.6 sievert/hour. It looks like Sarkozy needs to veer more to the right to capture Le Pen's supporters, if he wants to remain the president of the republic. PARIS, April 22 (Reuters) - Far-rightist Marine Le Pen threw France's presidential race wide open on Sunday by scoring nearly 20 percent in the first round - votes that may determine the runoff between Socialist favourite Francois Hollande and conservative President Nicolas Sarkozy. Hollande led Sarkozy by about 29 to 26 percent in reliable computer projections broadcast after polling stations closed, and the two will meet in a head-to-head decider on May 6. But Le Pen's record score of 18-20 percent was the sensation of the night, beating her father's 2002 result and outpolling hard leftist Jean-Luc Melenchon, in fourth place on 11 percent. Centrist Francois Bayrou finished fifth on less than 10 percent. Le Pen, who took over the anti-immigration National Front in early 2011, wants jobs reserved for French nationals at a time when jobless claims are at a 12-year high. She also advocates abandoning the euro currency and restoring monetary policy to Paris. Her score reflected a surge in anti-establishment populist parties in many euro zone countries from Amsterdam to Athens as austerity and the debt crisis bite. Voter surveys show about half of her supporters would back Sarkozy in a second round and perhaps one fifth would vote for Hollande, making her a potential kingmaker in the runoff. Also, we store the spent catalysts that contain radioactive materials in the warehouse inside the plant complex in strict adherence to the related laws and regulations. The warehouse is about 500 meters away from where the accident started. The containers are intact, and the current levels of radiation is the same as before the accident. The spent catalysts containing radioactive materials were stored in the warehouse in double-walled containers made of stainless steel. Explosions at the complex broke window glass of the warehouse, but there was no unusual measurement in the vicinity of the warehouse. Depleted uranium was used as catalysts in 1960s and 1970s. Hardly anyone wants to believe the official (government, the guilty company, mass media) accounts these days, but the official accounts continue to say there has been no leak of toxic chemicals or depleted uranium.